David Marks, the CEO of Loomia (profile) emailed me last night to tell me about new functionality and a new look and feel at the site. 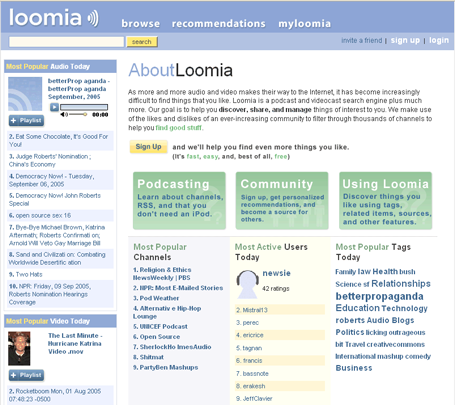 Loomia is an excellent podcasting and videocasting resource. You can subscribe to podcasts, and listen to them via the site or download them to your computer or device. The key value-add is their recommendation engine – you rate media and get recommendations based on your ratings v. ratings by other community members (it works in the same way that Netflix recommends new movies to you). In addition to substantial visual improvements, Loomia has added tagging of media, creating a great new way to find podcasts and videocasts of relevant content. Check out Loomia – it’s free and it’s the best resource we know about for finding new podcasting and videocasting content.